Spring is here and it seems that everybody is out and about exercising after the long winter. We have seen influx in our office of patients who have pain in the ball of the foot especially near the base of the second and sometimes third or fourth toes. Sometimes there is even swelling in the knuckle behind the second toe. This is known as the second metatarsal phalangeal joint or the second MTP joint. Pain in the second MTP joint is often diagnosed as second MTP joint capsulitis. This is a bit of a catch all term but in general is like inflammation of the ligaments around this joint because of a stress overload and increase weight bearing and a disproportionate manner to this joint. Most people with a problem here will get a localized pain in the joint sometimes the swelling. Oftentimes it has happened after wearing a pair of shoes that don't have as much support as typical with increased walking. Sometimes after returning from a trip to Europe wearing unsupportive shoes walking all over the cobblestone streets. Sometimes runners we'll get this after they've increased training. Or for example if they have been continuing to train but the shoes have worn out and have not been replaced. Sometimes there is no distinct clear-cut cause as to why this has started. Many of the problems and the feet are mechanical, and this particular problem is no exception. From a mechanical standpoint approximately 50% of the forefoot weight bearing load is carried by the great toe and the bones behind it including the first metatarsal. The remaining 50% is distributed a months the second third fourth and fifth metatarsals and the corresponding metatarsophalangeal joints (where the toes meet the forefoot) this entire area (MTP joints #1-#5) is also described as "the ball of the foot". A very common problem occurs when the first metatarsal does not carry its appropriate weight bearing load and therefore an increased load gets shifted to the remaining second third fourth and fifth metatarsals. Typically the second metatarsal is next in line and receives the brunt of this "stress overload". Over time this increased stress can cause problems including inflammation and pain and eventually damaging the second MTP joint capsule itself. When this damage occurs, often there is resultant misalignment of the second toe whether it starts to drift toward the great toe or starts to contract into what is described as a hammertoe. It is even possible over time for this capsule to completely breakdown and for the second toe to dislocate from the metatarsal head. This is also seen in some other conditions such as with rheumatoid arthritis. 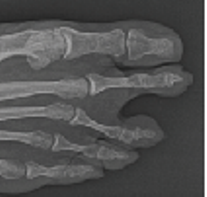 Additional common mechanical causes of stress overload to the second MTP joint include an elevated first metatarsal, a hypermobile first metatarsal, a short first metatarsal, where a long second metatarsal. In addition, hammertoe contracture can cause a retrograde buckling of the joint and abnormal pressure on the capsule and related structures. It is also interesting to note that a tight calf muscle can shift pressure from the heel to the forefoot too quickly. Imagine a woman who has worn high heel shoes much of her life and now has a tight calf. It's difficult for this individual to even walk flat-footed and often their practically walking on the ball of their foot instead of any significant amount of time on the heel. The foot is not designed to function this way and having a disproportionate amount of time spent on the forefoot as opposed to the heel is a serious mechanical problem. Once in our clinic after the initial physical examination of your foot and ankle, we typically will need an x-ray to evaluate the foot structure. We evaluate potential causes of pain in the second MTP joint area and rule out other potential differential diagnosis considerations such as a stress fracture or arthritis. Looking at the foot in a weight bearing position and gait evaluation can also be very helpful. Diagnostic ultrasound imaging can provide an excellent image of the associated structures including the capsule. But in some of the more difficult cases, we will need MRI evaluation to get a definitive picture and/or assessment of a tear of the capsule. A further sub-category of the capsule is the plantar plate. This can be torn and is also well visualized MRI evaluation. To summarize the differential diagnosis: Same the potential causes of this type of forefoot pain can include a neuroma, degenerative joint disease with arthritis, an inflammatory arthritic conditions such as psoriatic arthritis or rheumatoid arthritis, gout, a thin fat pad. Once the diagnosis has been made, and then treatment can begin. Because this is a mechanical problem, change in the mechanics of foot function and the way the foot interfaces with the ground is a good approach. This includes both shoes and prescription orthotics. There are some over-the-counter inserts they can provide temporary relief and support. Prescription orthotics can have specific modifications unique to the particular foot and the related pathology. The whole goal is to get the first metatarsal to bear more weight and the second metatarsal less weight. In addition to shift some of the weight bearing phase of gait off of the forefoot and allow a longer time frame with the heel strike phase of gait. Some of this can be quite complicated including both the orthotics and related shoe recommendations. But it is quite impressive what can be done by changing the mechanics here. Other simple things that can help include avoiding going barefoot at home, aggressive calf stretches, and a night splint. This condition is often confused with a Mortons Neuroma because the pain is felt in the same general region, however not in the exact same region. Many patients will complain of pain in this general area and a web diagnosis may lead them to an incorrect self diagnosis. Properly identifying the cause of pain is the first step to properly treating the condition.